Interweaving the alternating perspectives of Helen, her daughters, and the women surrounding them, “each new chapter brings a wise and tender look at single life, dating rituals, and marital unease” (New York Times bestselling author Jennifer Close). In this “absolute feat of storytelling” (bestselling author Grace O’Connell), Marissa Stapley celebrates the many roles modern women play, and shows that even though happy endings aren’t one-size-fits-all, some loves really can last for life. Mating for Life was an addicting read. I would say that this book is more about the characters versus the storyline. The storyline IS the characters. It’s like I had my own private view into their personal lives including their thoughts, feelings, fears, relationships and motivations. I wasn’t sure about the book when I read the description, but something inside me said to give it a chance. I’m so glad I listened because I adored Mating for Life. It’s going on my list of books you need to read! There are quite a few characters in this book. We meet Helen Sear and her three daughters, Fiona, Ilsa and Liane. I would consider them the main characters of the book. There’s a few chapters told in other minor characters points of view, but they all tie together in how they relate to the main characters’ lives and personal relationships. I loved that the characters were offbeat and real. I could picture them completely in my mind in how they looked and acted. I felt bad for Liane who was so insecure and Fiona annoyed me a little with how rigid and set in her ways she was. I liked Ilsa and could understand how she would do some of the things she does in the book. The author conveyed her emotions and motivations for her decisions in a way that I could relate to. I didn’t agree with some of the things the characters did, but that didn’t make me not like them. In fact, it made them seem more human and believable as we all make mistakes. The book has a few different settings- Toronto, Rye, NY and Muskoka. I loved reading the scenes at the cottage in Muskoka. I’ve been there years and years ago and it is beautiful cottage country. I could see the setting in my mind and it made me long for lazy summer days. 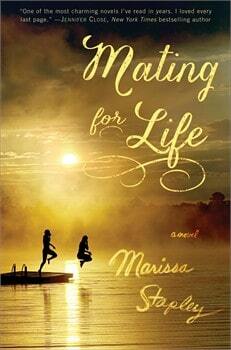 Mating for Life would be a great book to bring to the cottage this summer or to the beach. It’s one that left an impression on me and that I really can’t think of anything negative to say about it except that I wish it didn’t have to end! I need to put this book on my summer reading list. It sounds like something I would really like and get lost in. Looks like a good read, I’ll put it on my list! This books sounds like real life and something worth reading. Will look it up. This book sounds interesting, and I like when the novels are set in places, like the Muskokas or Toronto, that I’m familiar with. Sounds like a really good book! I like that its set in Ontario, my home province! THis sounds like it would be an enjoyable book to while away a summer day, reading about the different women and how they handled their lives and love life. Sounds like a great read! Thank you for your great review. I’m always looking for good summer reads. Thanks for the review! Love the title of this novel! I need to add this to me summer reading list! Sounds like a great summer read. I love the Canadian setting. Thanks for the review.I am collecting books now for my winter reading this sounds interesting.